Welcome to PRASM: Introducing "Fundraiser on the Runway!" Introducing "Fundraiser on the Runway!" Fundraiser on the Runway is a very unique event. It's a runway fashion show as you might imagine, but there's a heartwarming catch to it... 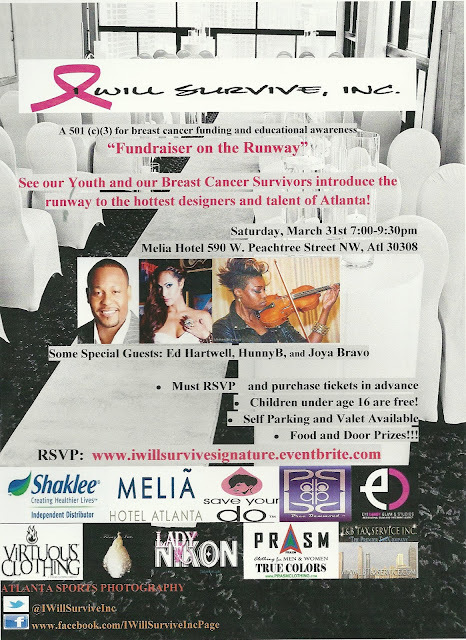 The show will feature our youth and breast cancer survivors strutting in some of the hottest designer fashions of Atlanta! PRASM is part sponsor for what will be a lovely event. It goes down in Atlanta this Saturday, March 31 from 7-9:30 p.m. If you're in Atlanta, this is an event you don't want to miss. It will feature fashions from some of Atlanta's hottest designers, special celebrity guests and a few of Atlanta's up and coming talent. PRASM is excited to take part in this fundraising event as a way to help raise awareness of breast cancer and to support the youth. We're also delighted to donate many of our color-focused belts and socks to Fundraiser on the Runway as a way to show our support! I hope those in the Atlanta area or those who will be visiting can attend this event! It's for a great cause and it's going to be fun fun fun! To buy our PRASM accessories, visit our website or search "prasm" on Ebay. A Photographic Journey with PRASM!